Echinocereus mojavensis is spectacular backlit with a full head of spines. The size and number of spines varies from almost none to a formidible set like these. Echinocereus mojavensis is native to the deserts of California, Nevada, Arizona and Utah. This cactus will require good drainage and full sun to thrive. Echinocereus mojavensis has brilliant red flowers in the mid to late Spring. Echinocereus mojavensis grows to a foot or so tall and the clump will spread several feet across. Echinocereus is winter hardy into the low 20°s F and likely colder. 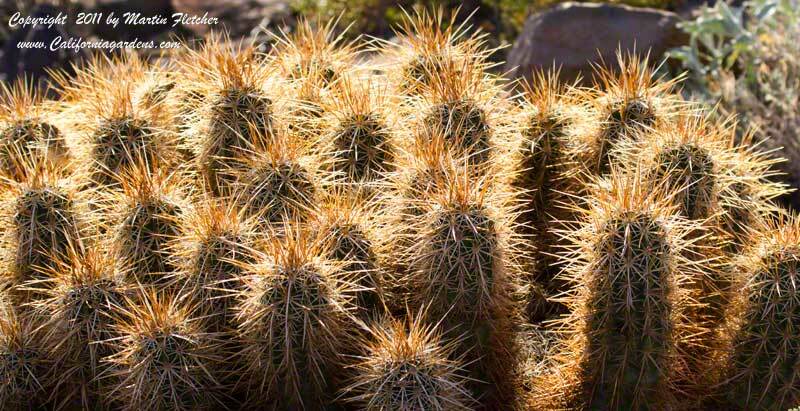 Backlit Spines of Echinocereus mojavensis - Mojave King Cup Cactus. High resolution photos are part of our garden image collection.